(Bloomberg) -- J.B. Hunt Transport Services Inc. plunged the most in three years after reporting surprisingly weak volume, spurring concerns that high inventory levels and a slow start to the spring shipping season could signal a broad economic slowdown. Container freight carried on J.B. Hunt’s trucks fell 7 percent in the first quarter, although the reasons were many. Fierce snowstorms and historic flooding in the U.S. were factors. So, too, was the decision by CSX Corp., the largest railroad in the Eastern U.S., to drop less profitable routes for so-called intermodal cargo, typically consumer goods in metal containers that can be carried by ship, train and truck. Investors and economists are concerned that a cargo decline may indicate a global slowdown that could ensnare the U.S. Such concerns were fueled by FedEx Corp. in March after the courier lowered its earnings forecast, citing sluggish international demand. 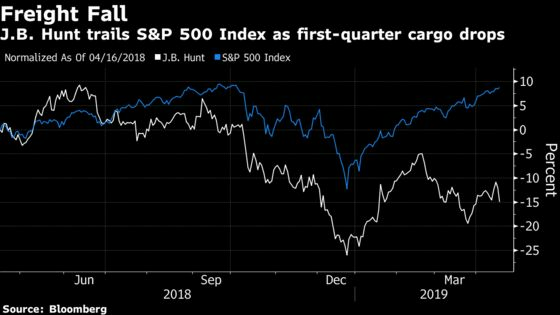 J.B. Hunt tumbled 3.8 percent to $101.52 at 10:22 a.m. in New York after dropping as much as 5.9 percent, the biggest intraday decline since August 2015. The stock declined the most in the S&P 500 industrials index and pulled trucking companies such as Knight-Swift Transportation Holdings Inc. Inventory levels have increased after U.S. companies rushed to import goods because of President Trump’s threat to impose more tariffs on Chinese goods. It will take time to work down those stockpiles, J.B. Hunt Chief Executive Officer John Roberts said on a Monday evening conference call with analysts after the company reported earnings.